WASHINGTON, May 26 (Reuters) - The U.S. government has licensed a Houston-based oil drilling group to travel to Cuba to start cooperation on safety and environmental practices following the Gulf of Mexico oil spill. The International Association of Drilling Contractors (IADC) said on Wednesday the Obama administration denied it permission to travel to Cuba in December, but reversed the decision apparently due to the attention the BP Plc (BP.L) well blowout brought to the potential for an environmental catastrophe. "The license was granted, curiously, just after the spill in the United States," said IADC Executive Vice President Brian Petty. "We are pleased the government has relented." The IADC is waiting for Cuba to set a date for a visit by a delegation of five of its staff to enhance Cuban awareness of global standards in the prevention of accidents, safety procedures and environmental protection, Petty said. The delegation would discuss the prospect of deepwater drilling offshore Cuba, the IADC. It would be the first time a U.S. oil industry delegation visits the communist-run country which has no diplomatic ties to Washington and is under a trade embargo enforced after Fidel Castro's revolution five decades ago. The IADC's members own most of the world's land-based and off-shore drilling rigs and are mostly U.S. companies. U.S. and Cuban diplomats have begun working-level talks on the risks from the huge Gulf of Mexico oil spill that could be carried to Cuban shores by strong currents. The oil gushing from a blown-out seabed well owned by BP in U.S. waters already has affected some parts of the U.S. Gulf Coast shoreline in what officials fear will inflict an ecological and economic catastrophe. Oceanographers are predicting that a powerful ocean flow known as the Loop Current could carry some of the oil southeast through the Florida Straits and threaten the coast of northwest Cuba, where the island's top beach resorts are located. Although the oil that could threaten Cuba is gushing from a well in U.S. waters, experts say there is the same risk of an accident in Cuba's plans to move forward with deepwater exploration drilling in its Gulf of Mexico waters. "It is highly likely that we will see drilling in Cuban waters later this year," oil expert Jorge Pinon said at a discussion of U.S.-Cuba engagement in the Gulf of Mexico at the New America Foundation, a Washington think tank. Several international oil companies have signed risk contracts to explore for oil in Cuba's Gulf waters, including companies from Brazil, Malaysia, Vietnam and Venezuela. Norway's Statoil (STL.OL) (STO.N) and a unit of India's Oil and Natural Gas Corp (ONGC.BO) have joined Repsol's venture. 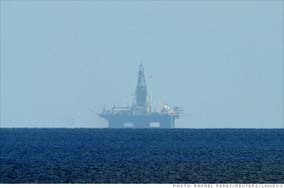 At a conservative estimate, there could be 4.6 billion barrels of undiscovered oil in the Cuban waters of the Gulf, according to the U.S. Geological Survey. The general assumption in the oil industry is that the restriction of the use of U.S. deepwater technology under Washington's trade embargo has delayed exploration of Cuba's oil and gas potential in the Gulf. But oil experts and environmentalists say it is time to allow full cooperation with Cuba in oil safety practices so that U.S. technology to be quickly mobilized in the case of an accident as serious as the Macondo well blowout.